Welcome to WhirlyBall Connecticut. Book your parties & events today! Email for details about our first ever WhirlyPong International Tournament and Leagues. 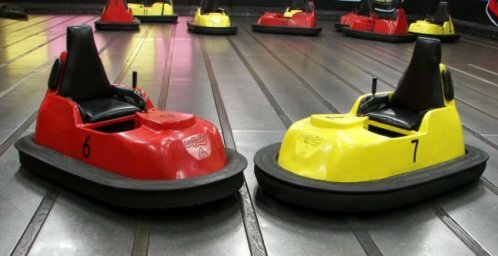 WhirlyBall is the hottest sport on the planet, and it's played right here in Enfield, CT! We put two teams of four players into a 4,000 square foot arena. Now we combine lacrosse and bumper cars, putting a scoop-styled racquet in everyone's hand. Add in some rules from basketball and hockey and we have a game! Then we add a ball to the mix and a goal at both ends, and you're ready to play the worlds only mechanized team sport! That's right! This only gets wackier from here because the game is played in bumper cars! But mind you, these are not your average bumper cars. The only similarity is the resemblance. WhirlyBugs are much more powerful, maneuverable machines, sending everyone down the court at 100 smiles per hour! WhirlyBall is sweeping the nation as the #1 corporate team building venue, and is the perfect place for all social events and private functions. For rates, beverage packages and the Whirlymenu check out the facility tab. For Tournament information check out the corporate events tab.